When negativity and anguish hits your brain, it becomes a little difficult to let go of all that at first. However, it is very important to quickly triumph over that pessimism in order to prevent it from taking over your mind completely. The prime mantra of letting go of negative thoughts is to release the grip they have over you. It is not essential that you let go of everything at once. Start to notice and appreciate yourself for the steady efforts that you make each day. This will bring greater peace to you over time. 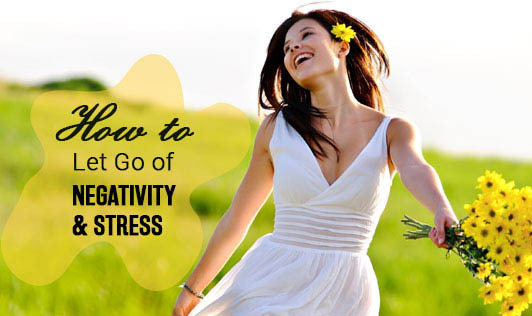 Here are a few strategies that can help in averting negativity and stress from your life. To let go of grudges, it is mandatory to acknowledge the problem first. You will never be able to solve issues until you completely eliminate them from your mind. A prolonged grudge does nothing, but, drain you out emotionally and physically, hence let it go and make some space for happiness and peace. Forgive and you will be free! If your brain is a tangled mess of views and thoughts, you must take up certain measures to clean it. Some people actually don’t realize that a cluttered mind and living space could actually be the cause of a lot of stress and anxiety. In fact, the hidden cost that this mess carries with it is a huge price to pay. If you feel that clutter is draining your body and mind, it may be time to begin streamlining your personal space. Criticizing yourself will only dis-empower you and negate your own abilities. Negative thoughts spoil relationships too, especially when you find yourself envying someone else’s success because you feel belittled by their triumphs. The first step is to become conscious of the tolerations of your life. Tolerations are those stress-inducing issues we encounter in our daily life, but cannot identify them because we get so used to dealing with them over time. Tolerations are quite easy to eliminate if you know how. Acknowledge them, and create a plan for eliminating them to bring goodness into your life. Relationships that are negatively competitive, lacking in trust, and are conflicted, are also huge causes of stress and negativity. They cause more stress in comparison to those relationships, which are not very cordial, but stable. Initially, minimizing stress levels by working on strained relationships may help, but if they are still not going the right direction, letting go of them is a better option.